A justly celebrated holding of the Princeton University Art Museum is the great portrait of George Washington at the Battle of Princeton by the renowned American painter Charles Willson Peale. Washington posed for the portrait, which was commissioned by the trustees of the College in 1783. (A frame that had originally encompassed a depiction of King George II and is itself of tremendous historical importance surrounds the work.) There is another painting in the Museum’s collection, however—one attributed to Peale’s younger brother James—which is also of compelling interest to scholars of the Revolution. This unsigned work, The Battle of Princeton, was a gift of the legendary Princeton trustee Dean Mathey, Class of 1914, and is thought to be a collaborative effort. Both Peale brothers had served in Washington’s army, and both fought during the critical Trenton-Princeton campaign—Charles as a lieutenant in the Philadelphia militia and James as an ensign with a Maryland regiment. Two years later, Charles returned to the Princeton battlefield and made sketches of the site for use in the backgrounds of his series of portraits of Washington. 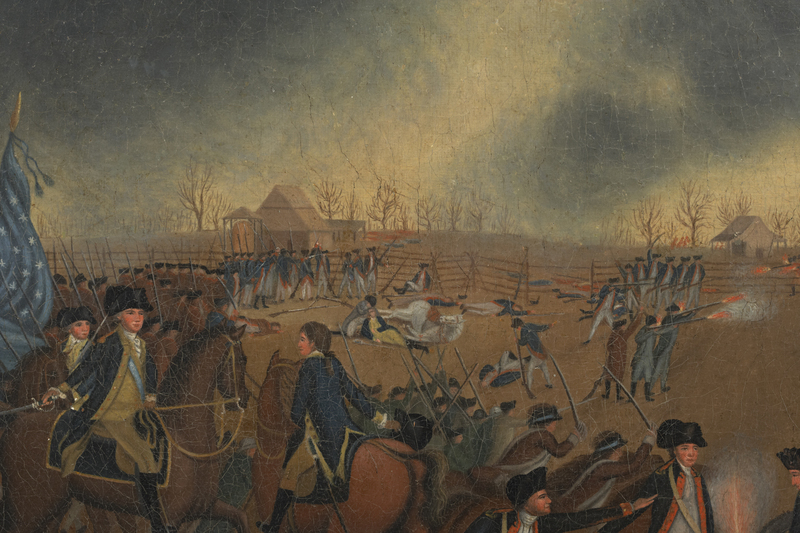 James, who is best known as a miniaturist, is believed to have used those sketches sometime in the mid-1780s to supplement what may have been his own recollections of the clash that took place near campus on January 3, 1777. Assisting James as an apprentice in the brothers’ Philadelphia studio was William Mercer, the deaf-mute son of the general slain during the battle; “Billy” Mercer would later execute his own copy of The Battle of Princeton, a painting currently in the collection of the Historical Society of Pennsylvania. 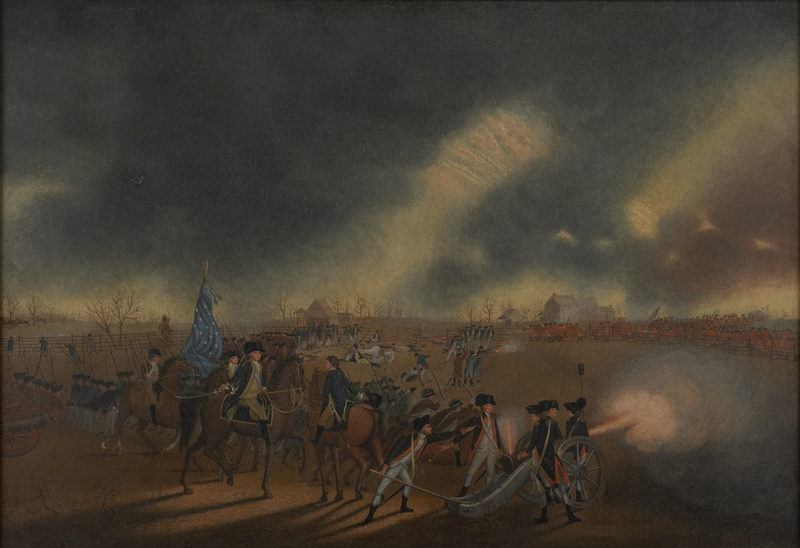 James Peale’s painting depicts the critical moment when Washington rode onto the battlefield and rallied the militia, which had been retreating before British attacks. On the right are the redcoats, their firing line ranging alongside the Thomas Clarke farmhouse, a structure which can still be seen at the battle site today. 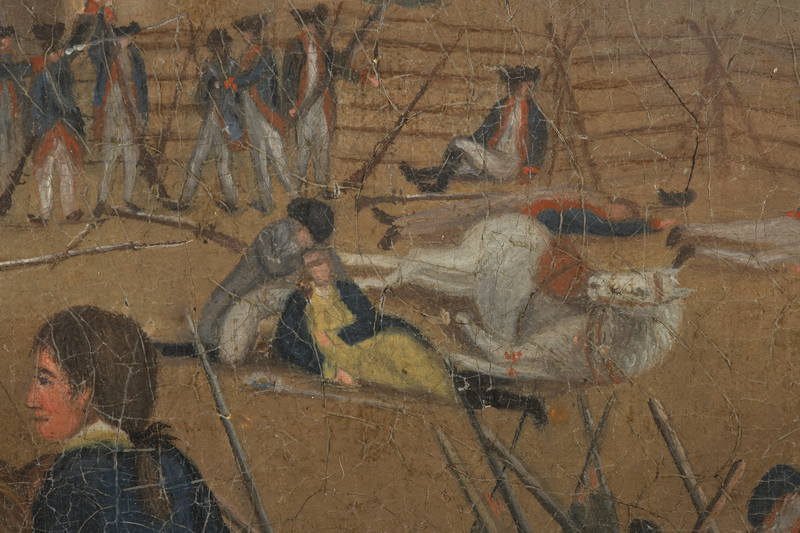 In the middle distance lies the prostrate form of General Hugh Mercer, Billy’s father, next to his wounded horse. General Mercer had as a young man served as a surgeon’s apprentice with Bonnie Prince Charlie’s Highlanders at the Battle of Culloden in 1746. After that disastrous defeat he sought refuge from the Crown in America, only to find death by British bayonets on a New Jersey farmer’s field, where it was said that the British mistook him for Washington. In the foreground is Washington, accurately portrayed as mounted on his chestnut, “Nelson,” who was inured to gunfire, rather than on his white charger, which was strictly a parade-ground horse. An added detail is the General’s unique headquarters flag, all stars and no stripes. Washington is giving orders to his artillery, commanded by Captain Joseph Moulder. It was the sudden appearance of Washington on the battlefield—he had initially been riding ahead with another portion of his force towards the College itself— and a volley of grapeshot from Moulder’s guns that turned the tide that January morning. It is a victory reflected by James Peale in the auspicious openings in the dark clouds in the dramatic sky, a victory that the colonists desperately needed to keep alive their struggle for liberty and freedom. Senior Associate Director, Annual Giving, Office of Development.